Last week I needed something easy to make for dinner. I just didn't have a ton of energy. 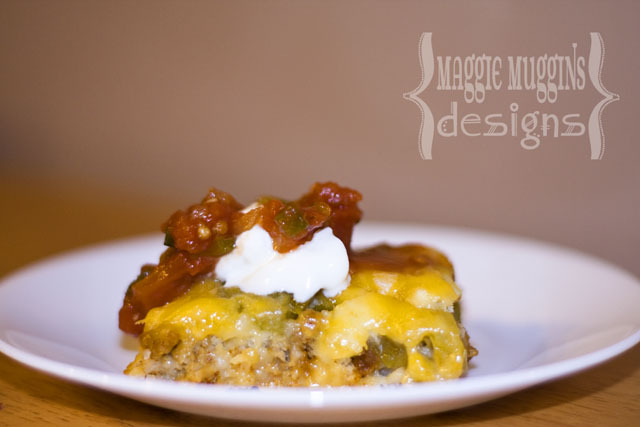 So I whipped out my recipe for Impossibly Easy Taco Pie. It's a spiced up variation of Impossibly Easy Cheeseburger Pie. Unfortunately, when I opened the cupboard to grab the Bisquick I realized I didn't have any. But I had Krusteaz . Of course, after a quick search on the internet: "Substitute Krusteaz for Biquick" I came up with the answer "No. Not the same thing at all." Of course not. 1 calls for milk and eggs and the other just water. But that got me to thinking and I re-read the ingredients. It already has milk and eggs in the package. So I decided, on a whim, to give it a try. Can I say - it was better than ever?! Krusteaz gave it that breaded taste, but the egg flavor was a lot more subtle! Wahoo! 1. Heat oven to 400°F. Grease 9-inch pie plate. Cook ground turkey and onion in 10-inch skillet over medium heat, stirring occasionally, until turkey is brown; drain. Stir in taco seasoning mix (dry). Spoon into pie plate; top with chilies to taste. 2. Stir Krusteaz mix and water until blended. I mix this to a slightly runny pancake consistency so add more water if needed. Pour into pie plate. 3. Bake about 25 minutes or until knife inserted in center comes out clean. Sprinkle with cheese. Bake 8 to 10 minutes longer. Cool 5 minutes. Serve with salsa and sour cream. i do a similar receipe that I call nacho pie. instead of pancake mix I use doritos and line the bottom of the pan with them add cheese (usually a mozerella and a sharp) add a mixture of taco stuff like you have mentioned(sometimes I add a can of refried beans to it and even better is a can of refried beans heated up with some sour cream to make it smoother) and then more cheese and another layer of doritos. made this for the family "smash or trash" night; it was a smash hit with requests to make again! Great, simple, quick recipe!